Four legged friends were regular flying companions for American airborne forces. 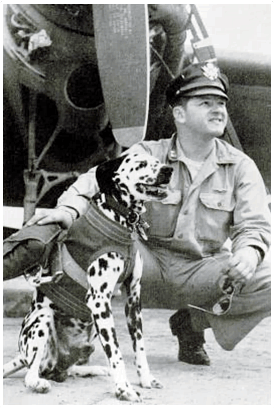 One of the most famous was an American-owned Dalmatian dog who clocked hundreds of hours and was noted in the log book as Major Jerry - just another aircrew member complete with a military number! Another story relates how a mastiff adopted by airmen at Folkingham flew regular sorties including surviving a crash in The Dolomites! And even the local dogs got in on the flying action. 'Major Jerry' flew in to RAF Barkston Heath from Sicily with his owner, Col Lewis S. Frederick. The handsome Dalmatian was even equipped with his own parachute. One report from the War Diary of 14th Troop Carrier Squadron at Station 283 (Barkston Heath) mentions that Col Frederick had rubbed Major Jerry's back a number of times for luck when he drew a drop zone spot. But it was all to end in tragedy. A mid-air collision of two Liberator aircraft near South Rauceby sent the 14th's plane crashing to earth. Two crewmen survived. Col Frederick did not. Major Jerry was severely burned. He was treated by local vet Denis Oliver (see his personal story here), nursed in an armament tent with a fire to warm him but died a week later. The war diary relates: "The dog's passing is not mourned, the men in the organisation doubting whether he would have been the same Jerry without Col Frederick. Jerry was just about the most one-man dog anyone has ever seen"
Col Frederick and his technical sergeant Paul G Sattler, were buried at the Cambridge American National Cemetery after memorial services at the base chapel, a convoy of trucks wending its way from Lincolnshire to his final resting place. The war diary log states: "The squadron cannot believe, cannot imagine, that the man who walked among them eleven months ago and told the assembled Squadron that the Fourteenth was his life, has actually given his life. "The spirit that motivated Col Frederick is identical with what he used to call the spirit of the Fourteenth. They are one and the same thing and too big and great a thing to have been interred forever with Col Fredericks remains. Wherever one turns in the Fourteenth one is constantly being reminded of the Colonel's activities, constantly expecting to see him stride in any moment with Jerry bouncing before him. 29th Troop Carrier Squadron added serious ballast to air craft flying out of RAF Folkingham when Pilot Chester Barber adopted Brutus, a 142lb bull mastiff, given to him by a English woman who could no longer feed the dog during rationing. Brutus clearly liked his new owners on the airfield, particularly the scraps from the mess hall, the Jeep rides and the hundreds of new friends, confirmed a former fellow pilot Joe Harkiewicz. The dog apparently also had a passion for flying, according to an article in 'Overpaid, Oversexed and Overhere' a 1992 Grantham Journal publication in tribute to the American contribution to the war, recording just how many Americans were stationed in and around the town in the build up to D-Day. His last flight was in a glider, when violent turbulence over the German Alps ruptured the tail section. The crew, Jim Curtis and John Kelly bailed out. They combed the woods looking in tree tops for signs of the glider and Brutus. When they came upon the wreckage, to their delighted surprise they heard a deep low-pitched 'gruff'. Brutus apparently showed no animosity towards Jim and John for putting him in this deplorable situation. John left Brutus with an American Army unit in Germany, reportedly saying: I hoped that his inborn British temerity would help his Army buddies scare the hell out of the Germans." Ron Marshall, a 13 year old boy living close to Barkston Heath, found himself a lucky mascot for American troops - together with his dog Mick. The friendly Americans welcomed Ron and his young mates, and found a flying role for Mick. "They seemed pleased to have our company. The Americans liked to have mascots, whether they were dogs or boys. Mick my dog often came with me. Then he took to going up there on his own. "One day I went to fetch him back. My friend Don said 'Mick's gone off in a Dakota. They wanted him as a mascot on a reconnaissance flight over Germany. I waited there and saw the Dakota land. Mick jumped out, wagging his tail as he came over to me."